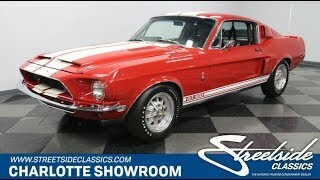 Hi, I am interested in your 1968 Ford Mustang Shelby GT500 (stock #5061-CHA) listed on Autotrader for $162,995. I'd like to get more information about this vehicle and confirm its availability. Youre looking at a real-deal and expertly restored 1968 Ford Mustang Shelby GT500 and it even has the paperwork to prove its legacy. So while you look over the bright paint, detailed interior, four-on-the-floor, and performance big block V8, we already know the everlasting appeal of a rare and speedy machine that has been finished to this caliber. The original generation Shelby GT500 is one of the most sought-after Mustangs around because it was never bashful about its sense of speedy style. The custom fiberglass hood, functional side scoops, spoiler rear deck lid, and the sequential taillights - it all makes an impressive statement. And with a full restoration in 2008, there was a big investment in keeping that bold style looking great. The factory-correct Candyapple Red has an amazing luster in the sunshine thanks to a professional hand laying down a modern clearcoat. The distinctive full white stripe package was laid down with the same care. So the sunlight loves to dance evenly across the crisp sheetmetal. This true GT500 gets the details right with the hood locks, snake-bitten badges (including on the gas cap,) and iconic Shelby 10-spoke alloy wheels with the correct-style Goodyear Speedway small letter tires. So yes, they really took the time to keep this one looking correct. The black bucket seat interior is clean and pristine, including the seat covers, door panels, and dash pad. Basically, this one feels factory correct right down to the folding rear seat. It wouldnt feel like a proper GT500 without features like the woodgrained two-spoke steering wheel (on a tilt-away column,) roll bar, full harnesses, and full gauge cluster, including the oil pressure and alternator readouts below the AM radio. Of course, one piece that will really impress everyone who looks inside is Carroll Shelbys signature on the dash. Under the hood is exactly what you want to see. This is Fords big 428 cubic-inch V8 borrowed from the Police Interceptor package. This is believed to be the original motor, and you can see there has been a huge investment here during the restoration. The bold blue block, hallmark fined air cleaner, matching valve covers, correct decals, and all the correct components looking so fresh make this engine bay award-worthy all on its own. Plus, the solid investment here also means this one fires up easily with a ferocious roar from the dual exhaust. But dont just hear the sound; follow its path in the undercarriage photos. There youll see more of the clean look and proper red oxide underside. The big four-barrel carburetor gives this big block serious power for the road. And they even upgraded this to a four-speed manual transmission so you get to have the ideal control over it all. Add in the sports suspension, power steering, and front disc brakes, this bright GT500 ready to take on any asphalt. An important car like this needs the right paperwork to back it up. Thats why the sale comes with the Shelby order sheet, Shelby invoice, and Marti Report. This is rarity restored with the respect it deserves, so if youre a true enthusiast, call today!